I appreciate reading your story. I was diasnosed with dysautonomia/POTS just a couple of months ago, and am in the process of working through various meds & helps. It’s so commendable that you are looking for God’s purposes in what you are going through, and are seeking to help others who are in similar circumstances! Wow. Thanks for sharing your journey. I can’t believe you found me through my Parenting Tough Teens blog- and our family lived in Katy for 7 years – 1999 – 2006! Our first son died of brain cancer at age 8 1/2 in 1998 so I started Global Hug Your Kids Day in his memory. Now our second son has disabilities which aren’t obvious which my blog is about. Sorry if this is TMI. Thanks for helping teens. They’re so often overlooked. Sound good to hear from you! Sorry to hear about your son’s disabilities. And I remember learning about your first son (at one of your events in Katy). So heartbreaking, but so inspiring what you did with your loss. I love Global Hug Your Kids Day! And the big props to helping the teens goes to my daughter Mikaela. She is my inspiration, a joy and decided to help other teens in similar circumstances despite being homebound / ill on most days. Great to hear from you and thanks for checking out our blog! Coming across your blog means the world to me. I had my first episode at 3 years old and have been in and out of doctor’s offices ever since. I was first diagnosed as epileptic, which was later changed to convulsive neurocardiogenic syncope after a positive tilt table test that stopped my heart for 12 seconds, beat twice, and then stopped for another 8 seconds. Unlike you (I assume), I was going through these tests in the 1980s when very little was known and there were no online resources like this. I grew up with the disorder, learned how to handle it as a teenager, and despite what the doctors told me, still deal with it as an adult. I have never been allowed to have a drivers license, and never will. My doctors also still scratch their heads – so little is known, and there is a lot of social stigma surrounding our invisible condition. But, I have a PhD and a great job, a husband and a family. In general, I have learned to live with it and have a happy life. I am proud of you for your attitude, and your desire to help others. It is exactly this kind of blog that is needed to change social stigma and educate people. Thank you for your strength. Thank you for your kind words, Erose. I am sorry to know you have been ill for so long, but so happy you moved forward towards school, career and family. I would love to hear any of your insight/advice with living with Dysautonomia, yet still reaching your goals. YOU are an inspiration! It is so inspiring to see someone so young reaching out to others in the midst of her own pain. I too suffer like you and was diagosed with lyme disease last year after years of being unwell. Have you been checked for lyme? Thank you Annie for your kind words! I was actually tested for Lyme disease back in my first hospital stay after I collapsed (they found I didn’t have it though). I will be keeping you in my prayers and I hope your struggle with Lyme disease gets better. Mikaela, I have Neurocardiogenic Syncope too. I have had it since I was 18 and am now 26. I was misdiagnosed with “anxiety” until 2011 when I finally met a doctor that would listen to me. I hope you are able to “out grow” the conditions just as I am working on that stage too. Thank you Alexa. Hope you are doing well! Hi Mikaela!! I am a little older than you, 23, and have recently been diagnosed with dysautonomia. I grew up and went to high school in Katy as well!! Small world. Thank you for sharing your story and raising awareness for this. I’m glad you finally have the diagnosis, and know that you’re not alone in this fight! 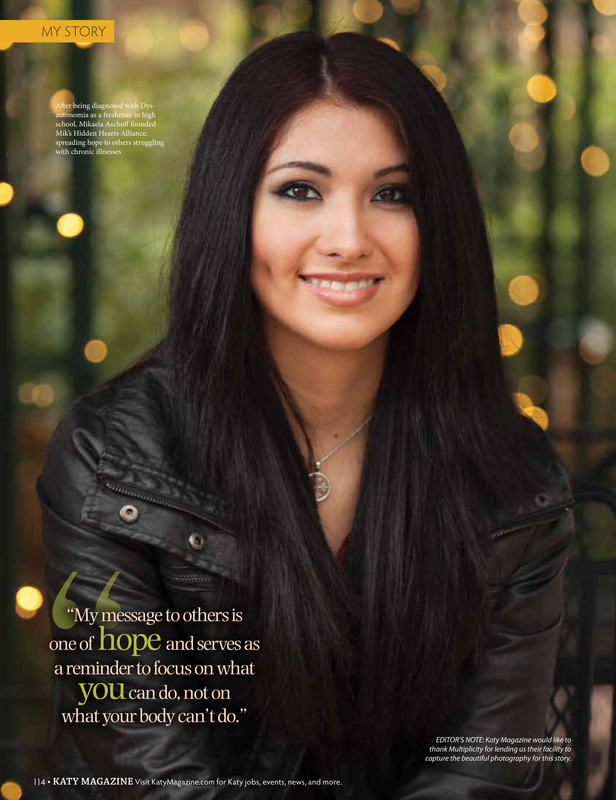 Mikaela, what a beautiful testimony you have! God Bless you for starting the Prom event!!! I wish I’d known earlier to spread the good word about it to fellow chronically ill friends in the Houston area. Listen, I also need a bit of help: I am looking for a Houston Dr that specializes in Dysautonomia type illnesses. I had a positive tilt table test for ‘mild’ POTS in FL, but most of my current doctors are dismissive of this result. Any feedback is greatly appreciated!! Keep up the great work!!! Hello Tammy! I am so sorry about the situation with your current doctors and the experience you have had with them. There is actually a great team of doctors at the Memorial Herman hospital in the Medical center that specialize in dysautonomia. The main cardiologist is Dr. Mohammed Numan and I highly recommend that you see him. Hope this helps! Hello there, I am looking for a Houston Dr that specializes in Dysautonomia type illnesses. I had a positive tilt table test for ‘mild’ POTS in FL, but most of my current doctors are dismissive of this result. Any feedback is greatly appreciated! !